Here’s some truly inspiring authentic mid-century paint colors for ranch homes. These “approved” mid-century paint color schemes come from Beatrice West for ranch homes in a PM housing development. I can’t find any additional info about PM, but I was able to track down a bit about Beatrice West. Selected as one of America’s outstanding women in the First Edition of Who’s Who of American Women, Beatrice West is a color consultant and designer of wide achievements. She is a color consultant and color stylist for home furnishings and building products, plus interior designer for commercial, institutional and residential clients. Architecturally trained at the University of Texas, Miss West has received nation-wide acclaim for aesthetic advancement of the American home. She is a pioneer in the color planning of mass housing developments and has color styled more than a million and a half homes. And an article where Beatrice West “authorizes” rich mid-century modern paint colors for modern homes. The mid-century modern colors she specially calls out are spruce blue, soft canary, pumpkin, driftwood gray and light pink. 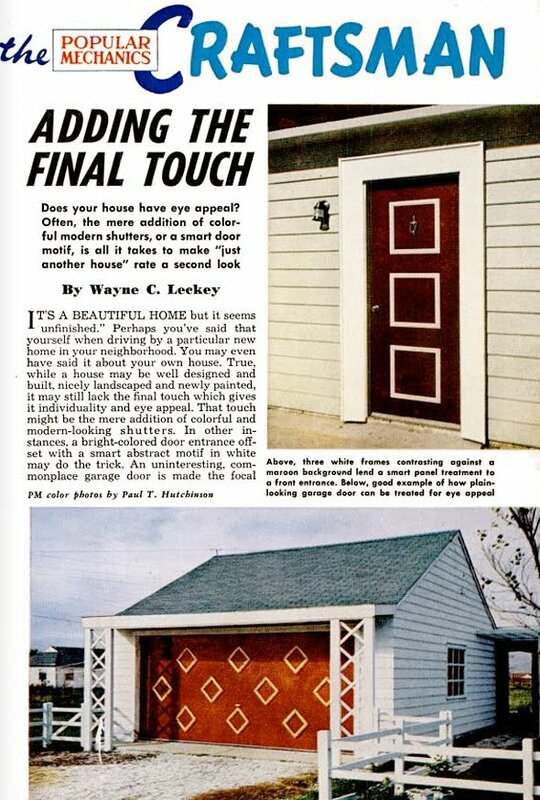 For the body of a mid-century home, she suggests pebble, gray, driftwood and spruce blue because they are “long-lasting body colors that fit almost any surrounding.” For accent colors she suggests limiting to shutters, window boxes and doors and making them brighter and lighter than the color of the house. Specifically she mentions modern paint colors such as citron, poppy and peacock. Beatrice West definitely knew how to put together an interesting mid-century modern color palette. 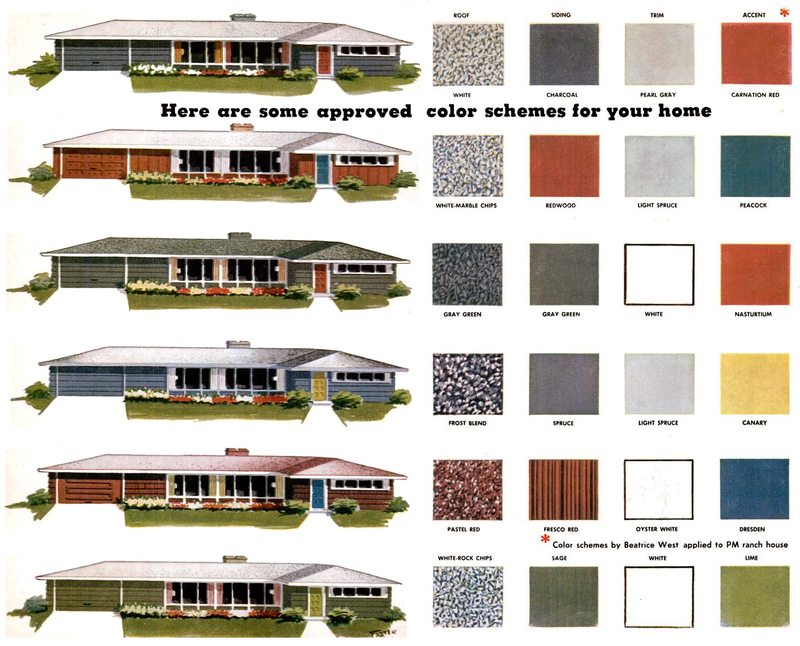 I think any of the mid-century color palettes above could easily be stolen for your next mid-century exterior paint job, especially if you have a ranch home. I've mentioned that I'm a copywriter in Austin a few times. Well, Apartment Therapy just posted a photo-filled article about where I work. No one in the office happened to mention to me that Apartment Therapy would be stopping by so I could stalk them observe them from a respectable and professional distance. Sadly, you don't really get to see just how much classic mid-century furniture we have around the office. 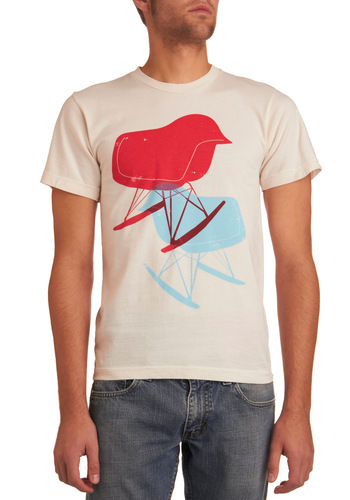 We have everything from a Marshmallow sofa to multiple Eames rockers to Womb chairs. It's seriously a great place to test out all the expensive mid-century modern furniture that I would never buy with a kid in the house. But perhaps that's too typical in these Mad Men days. 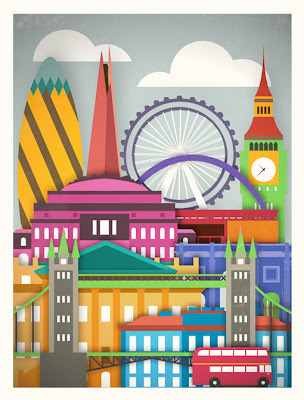 Touristique is a series of travel posters by Moxy Creative House. The series made up of major cities from around the world: New York, London, Paris, Toronto and Amsterdam. Each poster has the major landmarks of the city. For example, the London poster (above) has: the Gherkin, the London Eye, The Shard, Big Ben, Wembley Stadium, Royal Albert Hall, Marble Arch, Mansion House, Kensington Palace, London Tower Bridge and a double-decker bus. The bright colors and simple shapes would be great for almost any travel nursery. Uptown Modern currently has a Broyhill Brasilia dresser and dining table in stock. 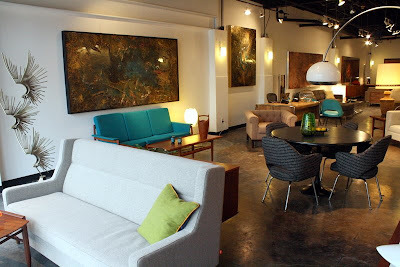 If you're in Austin, Uptown Modern is one of the best locations to find vintage Broyhill Premier furniture (and mid-century furniture in general). It's where we picked up our Broyhill Sculptra desk. Now that we've got our mid-century modern door installed, I've been obsessing about all the other porch details: a new mailbox, a new porch light, the possibility of a plant/planter and new mid-century modern house numbers. Honestly, some of my best ideas are just stolen from neighbors while walking through mid-century neighborhoods in Austin. While I don't think the "mid-century house numbers on the bottom of the door" look is right for my mid-century ranch, it might be fitting for your mid-century door. As much as I might like the look, I just couldn't bear drilling into our Crestview Door. But it really does look good from the sidewalk. I've always been a fan of the underground, both art and public transportation. I think the first time every American hears, "Mind the gap" in a station, a little bit of them falls in love with London. Over the years, the years the Tube has had some pretty great art made in its name, like the Tate Gallery Underground poster above. 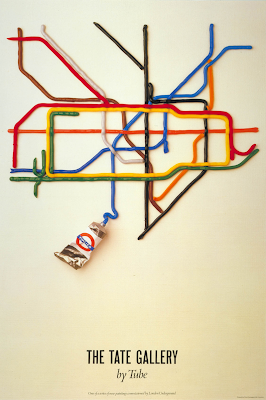 And now there's a site that lets you check out the art of the London Underground. You can look through current station art, see past collections or even get a sneak peek at future installations. It's worth the trip. 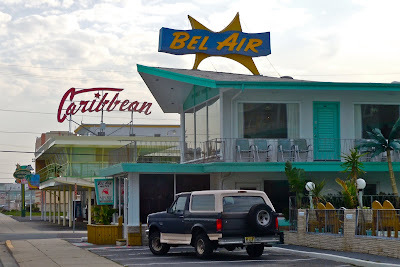 Googie architecture is a form of modern architecture, a subdivision of futurist architecture influenced by car culture and the Space Age and the Atomic Age. Originating in Southern California during the late 1940s and continuing approximately into the mid-1960s, Googie-themed architecture was popular among motels, coffee houses and gas stations. The school later became widely known as part of the mid-century modern style, elements of which represent the populuxe aesthetic, as in Eero Saarinen's TWA Flight Center. The term "Googie" comes from a now defunct coffee shop and cafe built in West Hollywood. I had never heard of Googie til today, but it was just one of those things you love but never had the right word for it. Now I can say, I love Googie architecture. And I've got this article to thank for introducing me to the word. Mac users, your standard wire trash can is already pretty mid-century. But PC users, your recycle bin could use a mid-century update. This custom trash can icon could be just the thing to bring vintage style to any modern desktop, Mac or PC. 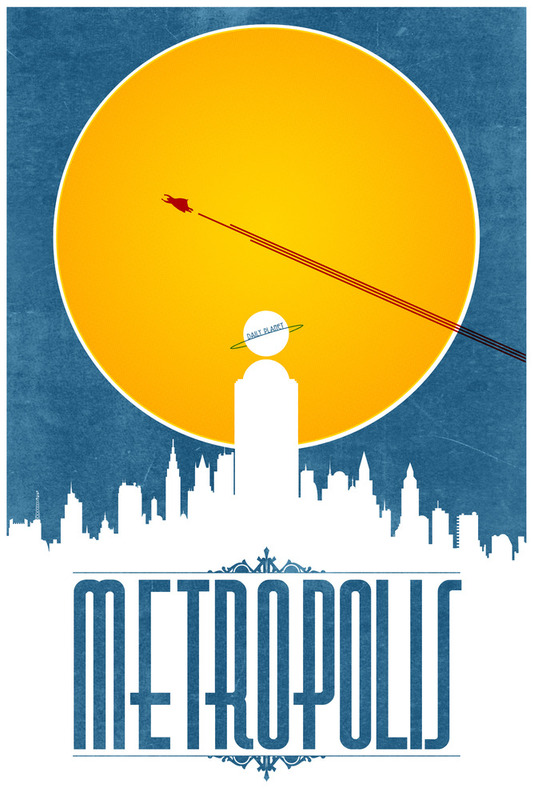 I've mentioned Justin Van Genderen's fictional travel posters before and personally lamented the fact that the Metropolis one was sold out before I learned about them. Luckily, the Metropolis and Gotham posters were so popular that Justin decided to issue a small batch of variant prints. Each print is limited to 60, and if you want a Metropolis print you should probably hurry. As of now, the Gotham variant print is already sold out. Welcome to a new feature here on Mad for Midcentury, Vintage Views. Vintage Views is where I’ll interview vintage store owners, mid-century furniture experts, mid-century modern housing fans and anyone else who’s knowledgeable in mid-century that will talk to me. 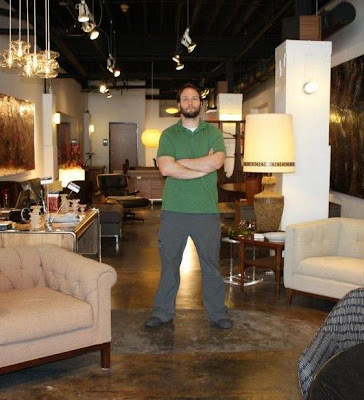 We start Vintage Views by talking to Joe Eggleston, owner of mid2mod in Dallas, TX. The mid2mod blog is a must read mid-century blog and the store is a definite destination for anyone in Dallas. 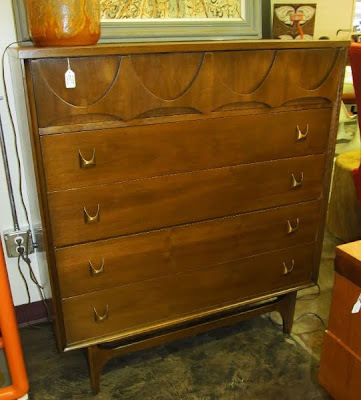 How did you get started in the mid-century furniture game? A few years ago, my wife Jennifer and I bought a 1950s ranch home. 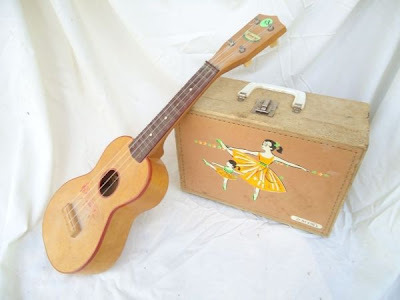 We were already estate salers and picked up small mid-century items fairly often, but we really stepped up our buying after we became homeowners. In 2010, when our house was finally full, we decided to open a mid-century booth at an antique mall with my mother-in-law, Dana. The booth didn't turn out to be as much fun as we had expected, so we had a yard sale and sold our entire inventory. Before we had even finished the sale, I looked at Jenn and Dana and said, "Be honest, aren’t you going to miss this?" After many long discussions, I quit my job and in 2011, we put our house on the market and moved into a tiny apartment behind our first storefront. mid2mod was born. It didn’t take long to outgrow that location and we moved to our current Deep Ellum location in 2012. 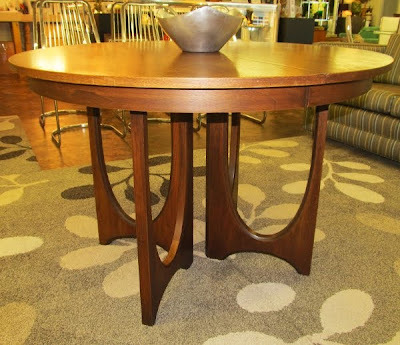 Do you have a focus or specialty, or do you buy anything mid-century that catches your eye? In order to get the store up and running, at first we bought whatever we could find and afford. Today, our focus is on beautiful, well-built designer furniture that is historically significant. How often do you go out looking for new stock? How often do you get new things in? I’m constantly looking for new stock. We average at least three or four new items every week, with the occasional truckload. What pieces have you bought for the store but ended up keeping for yourself? None. When we opened the store we decided that we’re in business to sell furniture, not decorate our house. There are pieces you really hate to let go, but if you ever kept one, you'd want to keep them all. To be honest though, when we have a ton of inventory and multiples of pieces, I'll probably start keeping some. 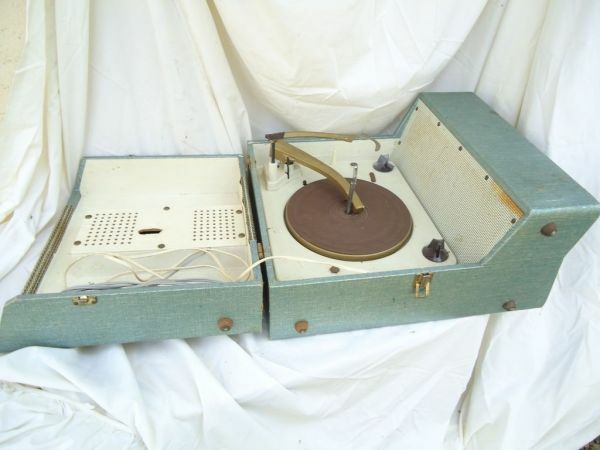 Do you do most of your shopping at estate sales or somewhere else? Somewhere else, but let’s keep some mystery about this business. Plus, mid2mod has been in business long enough that people contact me several times a week offering pieces for sale or consignment. These days, quite a few things come to us. What's your best find so far? Right before I opened the store, I scored an Alvar Aalto Paimio chair. I was probably more thrilled about that one than any other since, simply because it was the first. Do you have a piece that you've been looking for, but haven't been able to find yet, for yourself or the store? I’m still looking for a Mathieu Matégot wrought iron dining set for the store. I wish there were a secret that would make this business easier, but it's a matter of constantly being on the lookout, building contacts and turning over merchandise so you can keep buying new items. Probably the best advice I got at the beginning was from someone who’s been in this business a long time. He said, “Train your eye.” He was right. You have to know what you're looking for, otherwise you’re going to end up with a lot of junk. Create a large set of pieces in your head that you know is good design. Then gradually discover new things to add to the set, and commit to buying only from within that set. The only way you can accomplish this is by constantly researching and refining your taste. Do you have a favorite mid-century line or designer? That's a hard one; I've been really fascinated with Dunbar lately. I think my favorite piece ever is the Harvey Probber El Dorado sofa. But my favorite designer? George Nelson. No wait, Hans Wegner. I give up. I can’t narrow it down to one or even two. There's too much great design out there. 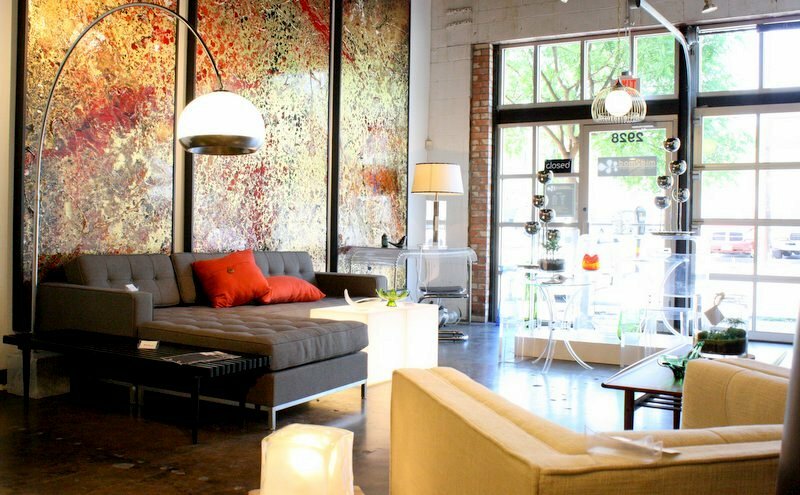 Next time you're in Dallas, be sure to check out mid2mod. 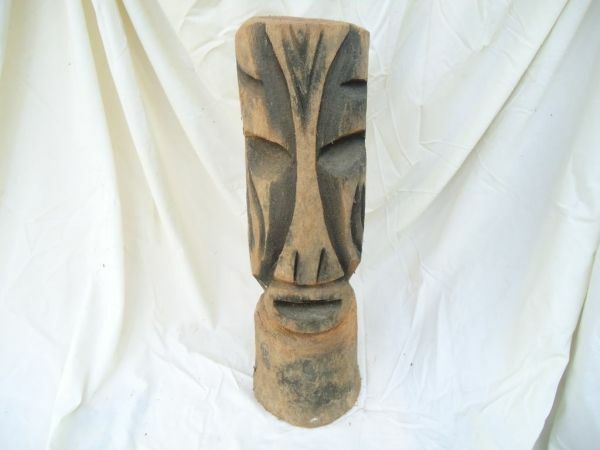 It looks like this mid-century Austin estate sale could have some intriguing small items to sift through. I'm always a fan of portable record players. 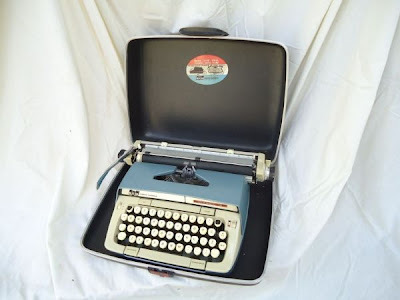 And vintage typewriters, especially ones that look to be in nearly perfect condition. 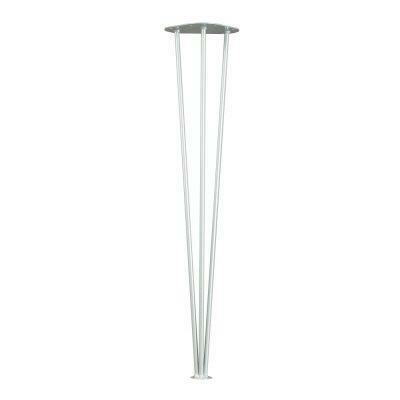 If you're still on the hunt for cheap hairpin legs, Home Depot (which used to be a good source) has stopped carrying the Waddell 3-bar hairpin legs. But you can still order the 28" version directly from Waddell. Sadly, it looks like the 15" version is no longer being made. My home computer still has the retro flip clock screensaver, but I recently changed my work computer over to The Weather, City Edition screensaver. It's a well-designed, modern-looking screensaver with a clock, the weather and the date. All handy info when running out for a quick lunch. 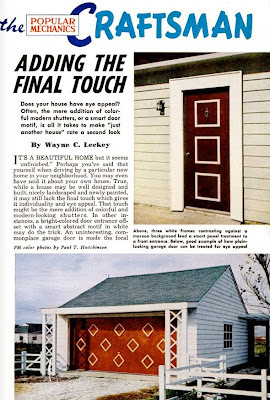 Here's a fairly short article, "Adding the Final Touch," from the March 1952 Popular Mechanics Craftsman section about mid-century garage doors, mid-century shutters and mid-century doors. More than a just good read, it's got some great photos of some very interesting mid-century modern door designs with some very brave mid-century paint colors. 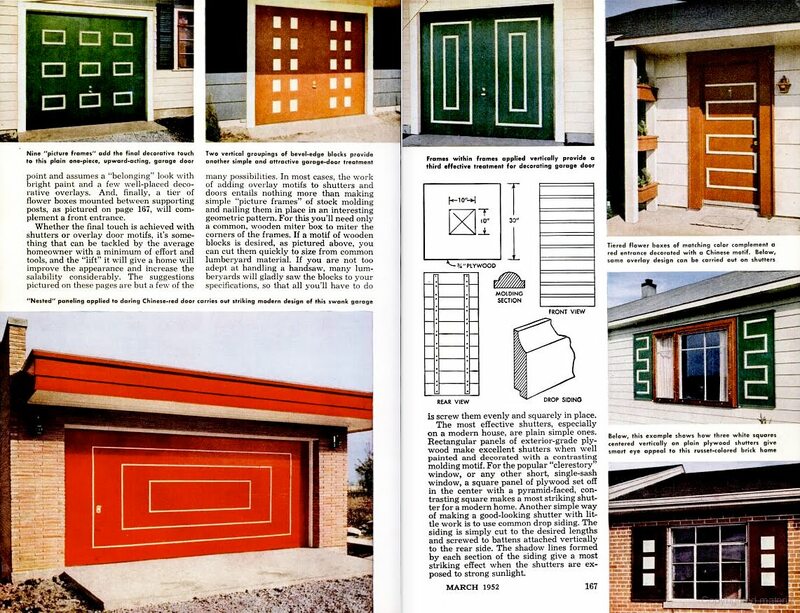 The key phase from the article about the mid-century design of these modern doors is, "A bright-colored door entrance off-set with a smart, abstract motif in white." I think that could be carried to any mid-century modern door design you might be looking to create these days. But I also might be a bit biased, based on my new mid-century modern door. As far as fashion goes, I'm definitely a t-shirt and jeans kind of guy. And this is definitely my kind of t-shirt. 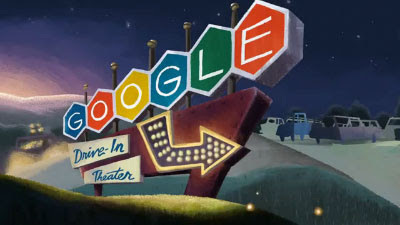 If you haven't seen today's Google Doodle it celebrates that mid-century tradition of the drive-in theater. 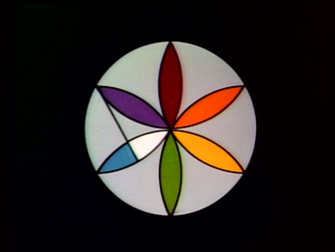 And there's a great mid-century Google logo to start the flick. Our mid-century modern front door is finally all finished. You got a sneak peek a while ago, but now it's painted and done. And boy does it feel good to be done. The Crestview Door kit worked out great. Although, they've recently started selling complete doors and we probably would have gone that route if they were available when we bought the kit. The Mad Men door knob and square mid-century door escutcheon turned out perfect. And the inside looks great too. We decided to go with white on the inside because it goes well with the gray walls, and that blue would have been too much for the interior. So, after picking our mid-century modern exterior paint colors, narrowing down the mid-century modern color palette for the door, deciding on which way our Crestview Door should point and tracking down the mid-century door hardware, the door has finally shut on the journey of our front door. 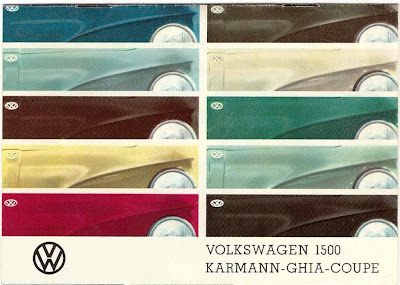 I've mentioned using mid-century car paint colors as inspiration for your mid-century modern color palette. 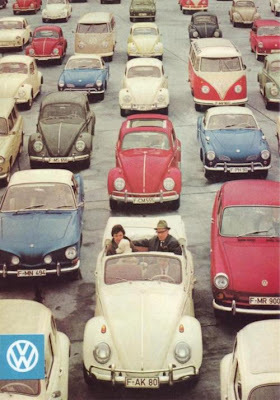 And I've hinted at my current '60s VW obsession. Well, worlds collided today when I happen upon this 1964 VW color chart. 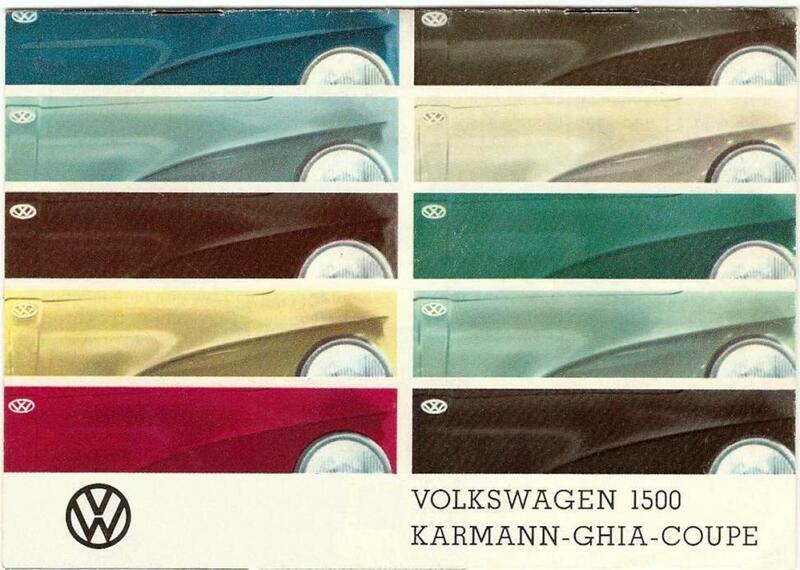 Those hoods could be solid inspiration for mid-century modern exterior paint colors. 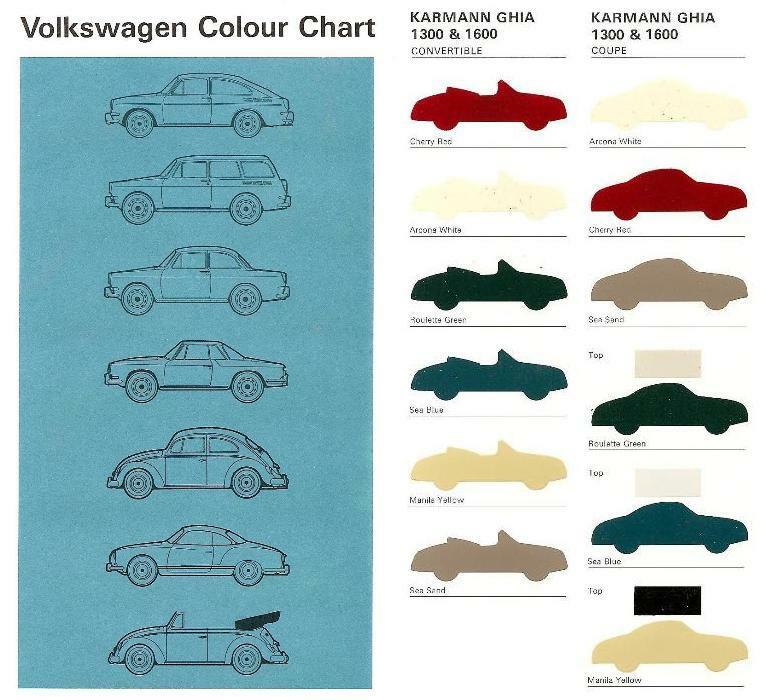 And these neat little car-shaped mid-century paint chips are just a cute part of a well designed brochure.